Have you ever been in an FMEA meeting where the team did not agree on the severity rating? Understanding and correctly applying severity risk is an important part of FMEA application. This article discusses the subject of severity risk, including examples for design and process FMEAs, and offers a tip on what to do when the team does not agree on the severity risk rating. 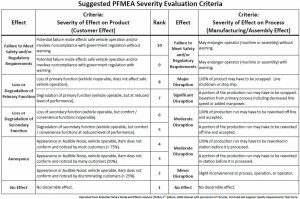 What is the definition of “Severity” in an FMEA? “Severity” is a ranking number associated with the most serious effect for a given failure mode, based on the criteria from a severity scale. 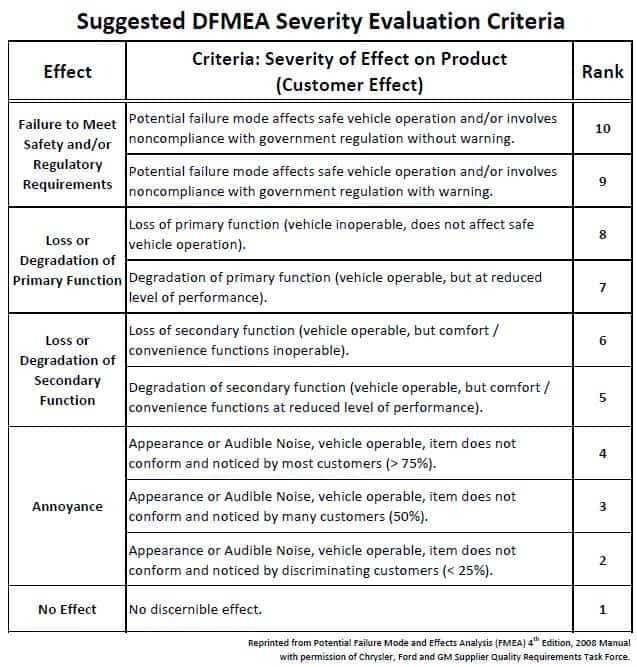 It is a relative ranking within the scope of the specific FMEA and is determined without regard to the likelihood of occurrence or detection..
How is “Severity” assessed in FMEAs? 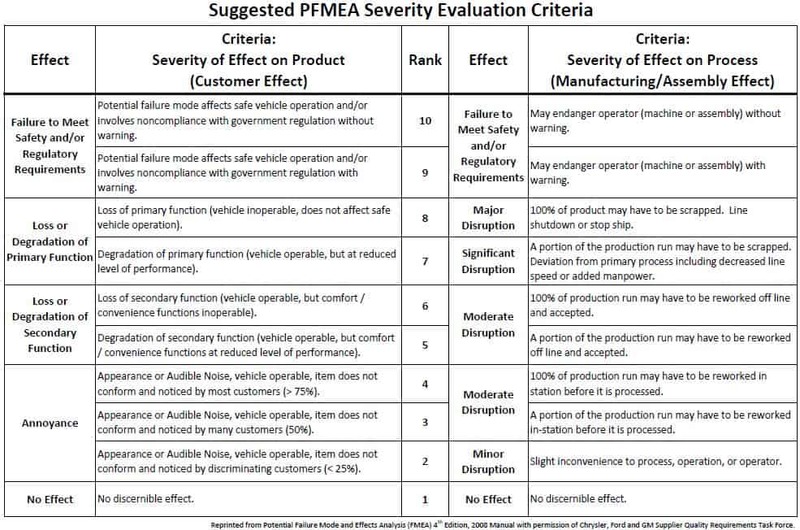 Having identified the most serious effect for the failure mode, the FMEA team assesses the severity ranking. This is the severity of the effect of the failure mode, not the severity of the failure mode itself. Using the agreed-upon severity scale, the team carefully reviews the criteria column to make this judgment. If the effect is well defined, the severity is easily established by reviewing the severity scale criteria. For Design FMEAs, the team assesses the severity of the end effect at system or end user. For Process FMEAs, the team should consider the effect of the failure at the manufacturing or assembly level, as well as at the system or end user. 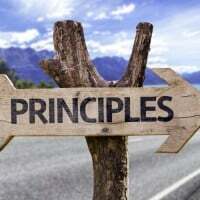 The severity that is used in the Process FMEA is the highest of the two values. What does a Severity Scale look like for Design FMEAs? What does a Severity Scale look like for Process FMEAs? 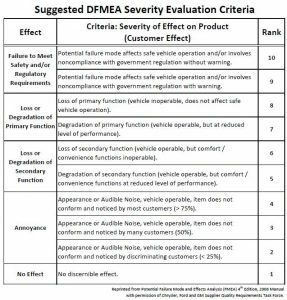 What is an example of Severity in a Design FMEA? What is an example of Severity in a Process FMEA? Function: Induction harden shafts using induction-hardening machine ABC, with minimum hardness Brinell Hardness Number (BHN) “X”, according to specification #123. Tip 1: In the case of items that are redundant, and there is no detection or no warning that a redundant item has failed, the severity should be assessed as if all of the redundant items have failed. Tip 2: If the effect is well defined, the severity is easily established by reviewing the severity scale criteria. Difficulty identifying the severity ranking is usually due to an improperly defined effect or inadequate severity scale criteria. Is action always required on high-severity issues? What if severity is high (9 or 10 on a severity scale of 1 to 10), and the occurrence and detection rankings are both low? Is action still required? This problem, as well as a challenging problem involving fail-safe strategies, are the subject of the next problem-solution article. The objective of implementing the control measures is to increase the detectability and decrease the occurence. Even the severity too is reduced. But i heard from few QA professionals that the ‘severity cannot be changed” the value of severity remains the same after implementing the control measures. Is this right? if the severity value was 7 before mitigation, it would remain 7 after mitigation too. My thoughts on this are different. According to me the severity and occurrence both are reduced after your control measures are put in place. It depends on the type of control measures that we use. For eg. handling of clinical samples after wearing gloves reduces the severity of the harm. I get this question about whether or not severity risk can be reduced quite often. The short answer is “yes,” under certain circumstances. When it is possible, it requires a system design change. There are four strategies to reduce severity risk that I outline in chapter 7 of my book, Effective FMEAs. “A fail-safe design is one that, in the event of failure, responds in a way that will cause minimal harm to other devices or danger to personnel. Fail-safe does not mean that failure is improbable; rather that a system’s design mitigates any unsafe consequences of failure. In FMEA language, fail-safe reduces the severity of the effect to a level that is safe. “A fault-tolerant design is a design that enables a system to continue operation, possibly at a reduced level (also known as graceful degradation), rather than failing completely, when some part of the system fails. In FMEA language, fault-tolerance reduces the severity of the effect to a level that is consistent with performance degradation. A redundant design provides for the duplication of critical components of a system with the intention of increasing reliability of the system, usually in the case of a backup or fail-safe. This means having backup components that automatically “kick in” should one component fail. In FMEA language, redundant design can reduce the occurrence of system failure and reduce system severity to a safe level. This strategy can be employed to address single-point failures. An example of reducing severity risk using “Fail Safe” is laminated safety glass for windshields prevents injury from glass shards. An example of reducing severity risk through Fault Tolerance is “run flat” tires. A passenger car can have “run-flat” tires, each of which contain a solid rubber core, allowing their use even if a tire is punctured. The punctured “run-flat” tire is effective for a limited time at a reduced speed. Hope that helps. Feel free to ask any follow-up questions. Sir,can I get the formula for reducing the occurance ranking for redundant systems and also suggest how to reduce the severity ranking in case of reduncy . I’ll begin by quoting an excerpt from chapter 7 of my book, Effective FMEAs. I’ll reply to your questions in two parts. First, you asked for the formula for reducing the occurrence ranking for redundant systems. This depends on the system configuration. I’ll illustrate with a hypothetical example. If component A has a failure rate of 1 in 500, then according to the AIAG v4 scale, this could be assessed an occurrence ranking of 6. If the system configuration is changed to add a second component A in parallel (redundant), then the likelihood that both components fail is (1/500) x (1/500) or 1 in 250,000. Using the same AIAG v4 scale, the team could assess an occurrence ranking of 1 or 2. Second, you asked how to reduce the severity ranking in the case of redundancy. Using the hypothetical example of a safety-critical component A, we can assume that failure would lead to an effect that is safety related. Using the AIAG v4 scale, this would be assessed as a severity 9 or 10. If the system configuration is changed to add a second component A in parallel (redundant), then the severity of effect when component A fails, at the system level, is reduced to a 7 or 8. There may be a degradation of primary function, but the system is safe. Please feel free to ask any follow-up questions.